In the second game for the Foundation Coverage Division, two teams with a very strong fan backing and well know names in the cosmetics industry battle it out. 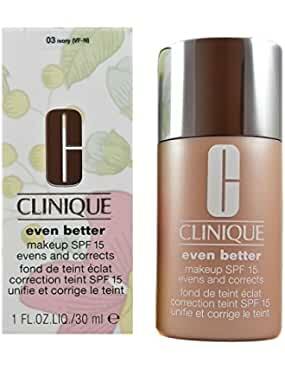 It’s Clinique Even Better Makeup vs Covergirl and Olay Tonerehab 2-in-1 Foundation for the title of Foundation Queen. Do You Want the FAVORITE For this Game? The Clinique Even Better Makeup team originated from the labs of Clinique Laboratories, LLC. Clinique has created hundreds, maybe even thousands of teams before. But, this is their premiere, you might say foundational cosmetic product (pun intended). 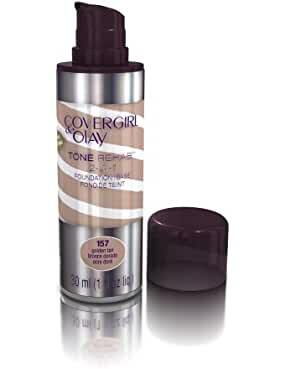 Covergirl and Olay Tonerehab 2-in-1 Foundation is a joint venture between two giant names in cosmetics. Both live under the Proctor & Gamble umbrella. So, it’s not suprising that these to subsidiaries have been brought together to take the best of both worlds in creating this foundation product. The Foundation Coverage Division’s second game of the Lotion Challenge season should be a bloody battle that might leave a mark (that needs covering). So, the winner should be able to help the loser to keep looking good. Will the Clinique brand take it’s history of success and wipe the field clean? Or, will the the combination team of Covergirl and Olay work well enough together to double team Clinique and build an infrastructure of success? This Clinique Even Better Makeup roster is a broad collection of talent. Some are more active than others. And, some don’t always make the trip to the games. The Covergirl and Olay Tonerehab 2-in-1 Foundation team has combined the best of Covergirl and the best of Olay in this compact but potent team. But, can the coach pick and choose the right combination of players to play to knock of its opponent. Clinique wins the coin toss and will receive. 0 - 0 15:00 Covergirl and Olay kicks off. Clinique Even Better Makeup wins the coin toss and will receive the opening kickoff. The Clinique Even Better Makeup coach opens the game with a risky play by chosing Octinoxate. But, Octinoxate is 6% of this teams production, so coach thinks the risk is worth it. Octinoxate provides its primary function as a Ultra-Violet absorber and filter very well. But, Octinoxate has been getting some bad press lately for several reasons. First, Octinoxate is not friendly to the oceans coral reefs. If used at a beach with coral reefs, enough of a concentrate of Octinoxate can bleach the reefs. Second, Octinoxate doesn’t help to protect from UVA rays. Because Octinoxate provides enhanced skin absorbtion, it can cause enhanced absorbtion of the wrong ingredients. As a result, it can produce estrogen like effects. It should not be used by pregnant women, nor by children. Octinoxate begins the series in a hole because of a horrible return. But, Octinoxate quickly gets out of the hole using its positive traits to shield off attackers (sun rays) for a 1st down. With short bursts of estrogen, Octinoxate obtains another first down. Things are looking good as Octinoxate has dug the team out of a big hole. But, then Octinoxate’s past catches up with Octinoxate. The defense is able to absorb the estrogen punch, and intercepts Octinoxate’s attempt to pass the ball down field! Covergirl and Olay take over at the Clinique 49 yard line. Wanting to take advantage of the turnover, the Covergirl and Olay Foundation coach quickly taps Talc to go into the game. Talc has some detractors that claim he can be toxic and carcinogenic. But, those reports so far don’t seem to have enough meat to stick to the bone. Talc can be abrasive. But, coach loves that about him. Talc is also absorbant, a skin protector, and bulks up in the weight room (a bulking agent for the team). Talc starts the drive off at midfield in great field position after the turnover. Using his bulking features, Talc plows for runs of 8, 4 and 5 yards to almost get into field goal range. But, then Talc starts to get into trouble. Using his absorbant talents, he tries to take in a pass absorbing the ball with his body. But, the Clinique defenders get into his head and call him Cancer-boy to throw him off his game. Trying a little too hard to shut them up, Talc squeezes the ball too hard and it squirts out for an incompletion. After a couple of incomplete passes, the coach has a decision to make on 4th down. Because a FG attempt from this distance is risky with the weather, coach decides it’s four down territory and goes for it on 4th and 5 yards. Talc speeds into the DBs hard and tries to turn on a dime. But, his shoes fail him and his slip modifier talents throw him to the ground. The incompletion turns the ball over on downs. Clinique takes over at the 32 yard line. The Clinique Even Better Makeup coach was not happy with the first drive, so he goes with Methyl Trimethicone for the second drive. Methyl Trimethicone, or TriMeth, is a little known player. However, with so little exposure, no one has been able to find any flaws in his game. Coach has seen good things from TriMeth in practices. So, he throws him out to the wolves to try and get Clinique onto the score board. What is know about TriMeth is that he is good at conditioning skin and can solve defenses (a very good solvent). Bring his conservative game to the field, TriMeth runs on 6 of the first 7 plays from scrimmage. An 11 yard catch is mixed in to keep the chains moving. Coach calls a timeout after the 7th play to give TriMeth a breather after the heavy payload he was carrying. And, to discuss going for a 4th down and 4 yards at the Covergirl and Olay 38 yard line. After the timeout, TriMeth tries to get the defense to jump offsides with a hard count. But, seeing that they were prepared for that, TriMeth solves the defensive lineup and audibles to a quick out pass. The quick down and out goes for 7 yards and a first down. After two runs to condition the defense, TriMeth throws up a deep out pass that is completed for 17 yards and a first down at the C&O 11 yard line. Coach tries to condition the skin of the defense some more with two more runs. But, the C&O defense is resisitent to TriMeth’s pounding and stuffs him for two 1 yard gains. On 3rd down, TriMeth drops back to pass and looks towards the WR that has been moving the team down the field. But, two DBs have him blanketed and with the defensive line coming hard, TriMeth throw high and hard to his TE in the end zone. But, the pass was rushed and sails high. TriMeth chips in a 29 yard FG to get Clinique onto the score board! After the defense held Clinique to a FG, the Covergirl and Olay Foundation coach reflects on his choices and goes hot. Ethylhexyl Methoxycinnamate, or Glass Crank as he’s known to teammates, has strong talents protecting the team from the hot rays of the sun. However, when Glass Crank loses focus, the burn can turn. Coach as Glass Crank going conservative early in the drive to keep the team protected and out of UV ray’s defensive attacks. A strong runs and short pass move the chains out to the 30 yard line. Two more conservative plays keep Glass Crank out of trouble, but leave the team with a 3rd down and long. Glass Crank is instructed to not throw into coverage, and ends up taking a big sack. But, on the play, the UV defense goes a little too aggressive and draws a 15 yard facemask penalty. Another two conservative plays move the chains once more as Glass Crank is starting to feel more confidence with his short passes going for decent chunks (11 yards). The 1st down winds the clock down and the teams switch sides. With the new defensive angles, the UV ray defense starts to break down Glass Crank’s UV protection. A run is stuffed in the backfield for a 2 yard loss. Then, on 2nd and 12, Glass Crank loses patience, and attacks the strenght of the UV ray defense with a laser pass. UV ray is one of the strongest in the game and easily deflects the laser pass up into the air. A lucky bounce ends with UV ray snatching the ball from the air and burning down the sidelines for a scorching 63 yard INTERCEPTION for a TOUCHDOWN! The extra point is GOOD. I love Clinique. They should destroy Covergirl. Covergirl also has teamed up with Olay for this product. So, you never know! Good luck for your team.